The charming city of Lucca is laid out on ancient Roman roads and framed within well-preserved and photogenic medieval ramparts. It is an ancient city, founded by the Etruscans and a Roman colony from 180 BC, and still boasts many fascinating old buildings. The city walls are one of the main attractions as they are still perfectly intact despite the expansion of the city and their great age. The city is also famous for being the home of Puccini and has an appropriate reputation for wonderful chamber music. Casa di Pucini makes an interesting visit for opera lovers on holiday here, as this 15th-century house is a shrine to the composer who lived and worked here. 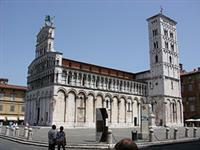 Lucca is also celebrated for its museums, monuments and splendid Romanesque churches. With its flat terrain and narrow lanes, Lucca is perfectly suited to explorations on foot or by bicycle, the same methods local people use to commute. Key sights on a visit to Lucca are the Duomo, San Michele, San Frediano, Museo Nazionale Guinigi and Torre Guinigi. The remains of an ancient Roman amphitheatre can be found on Piazza del Mercato, lined by buildings dating from the middle ages.